An interesting story broke last week when the Iranian propaganda machine managed to slip a doctored missile shot by the U.S. media. A couple things to note here. First, yes, we need to be diligent about examining images that we pass along as news. 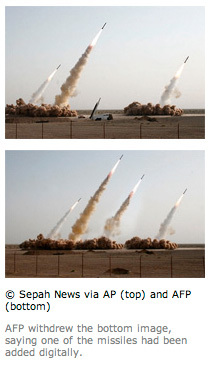 This side of the story is covered well by Daryl Lang in his PDN article, Newspapers Plan Corrections Over Iran Missile Photo. Be sure to click on the More Pictures link in the article that shows you how the image was doctored. But in addition to that, what disturbs me is that there are still three real missiles in the shot. Yes, the doctored image is more ominous, I guess. But seeing a trio of rocket-propelled weapons arching upward is quite frightening all on its own. Should we be the only ones allowed to have missiles? After all, we are still the only nation to use nuclear bombs in combat.